The under tack show for the Texas 2-Year-Olds in Training Sale was held Sunday, April 8, at Lone Star Park. Videos will be posted later this evening. To view a list of all times from the under tack show, click here. TTA Sales and consignors have posted dozens of photos and videos in advance of the Texas 2-Year-Olds in Training Sale set for Tuesday, April 10 at 12 noon at Lone Star Park. Photos and videos can be viewed by clicking the individual hip numbers in the interactive sale catalogue. Videos of the under tack show, which will be held Sunday, April 8 at 11 a.m., will be posted online that evening. A live video feed of Tuesday’s sale will also be available. A total of 126 head have been consigned for the Texas Two-Year-Olds in Training Sale on April 10 starting at 12 noon at the Texas Thoroughbred Sale Pavilion at Lone Star Park. The under tack show is set for April 8 at 11:00 a.m. at the track located in the Dallas-Fort Worth metroplex. This catalogue represents a 20-percent increase in the number of head compared to last year, and the sale has also eclipsed itself with a considerably-improved quality in pedigrees. Such national sires as Blame, Congrats, Curlin, Flat Out, Gemologist, Into Mischief, Jimmy Creed, Kantharos, Kitten’s Joy, Munnings, Orb, Paynter, Point of Entry, Shanghai Bobby, Stay Thirsty, Street Boss, Street Sense, Tiznow, Twirling Candy and Uncle Mo give evidence that the sale has surged upward after the solid performance of last year’s auction. Cairo’s Prince and Will Take Charge lead a list of first-year sires that includes Can the Man, Cross Traffic, Goldencents, Moro Tap, Shakin It Up and Sum of the Parts. Leading the regional sire contingent is Texas’ leading sire Too Much Bling, with solid company from Closing Argument, Euroears, Grasshopper, Half Ours, Intimidator, My Golden Song and Special Rate. The sale again features a unique interactive online catalogue where consignors can post photos and videos as well as the pedigrees of their sale horses for buyer perusal prior to the gallop show. This year the gallop show is being filmed by the Ocala, Florida-based group Dillon Video and Photo and is expected to be online shortly after the gallop show on April 8. 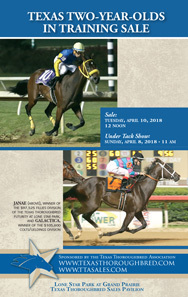 The cover of this year’s catalogue features the 2017 winners of both divisions of the Texas Thoroughbred Futurity at Lone Star Park, Carl Moore and Brad Grady’s Galactica and Susan Moulton’s Janae. Both horses went through the ring at last year’s 2-year-old sale and gave early returns to their owners. The two divisions of the race this summer are estimated to have purses of $100,000 apiece. 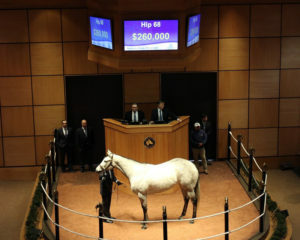 This will mark the third juvenile sale held by the Texas Thoroughbred Association in partnership with Lone Star Park. The 2016 auction featured 85 head, and the catalogue grew to 105 head last year. Catalogues will be mailed out the first week of March. The sale can now be viewed on the TTA Sales website by clicking here as well on the Equineline Sales Catalogue app. Stakes winning broodmare prospects and in-foal mares were the most popular commodities during the first session of the Fasig-Tipton Kentucky Winter Mixed Sale on February 5, and a Texas-bred graduate of the Texas 2-Year-Olds in Training Sale topped the session.. The session saw multiple six-figure sales for yearlings, broodmares, and racing/broodmare prospects. The session topper was multiple stakes-winning Texas-bred Bling On the Music (Hip 68), purchased for $260,000 by International Equities Holdings from the consignment of Baccari Bloodstock, agent. Winner of the Gold Rush Futurity at Arapahoe Park and Texas Thoroughbred Futurity at Lone Star Park at two, Bling On the Music also finished third in the Pocahontas S. (G2) on the way to career earnings of $153,167. She was sold as a broodmare prospect. Bred by W.S. Farish and sired by Too Much Bling, who previously stood at Farish’s Lane’s End Texas and now stands at Valor Farm in Texas, Bling on the Music originally sold for $95,000 at the Texas 2-Year-Olds in Training Sale at Lone Star Park. She was purchased by Danny Keene from the consignment of Asmussen Horse Center. The Texas Thoroughbred Association, in partnership with Lone Star Park, has announced its sales dates for 2018. 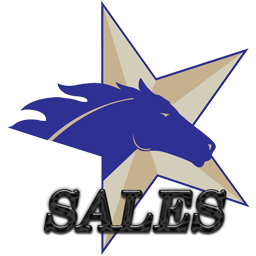 The Texas 2-Year-Olds in Training Sale will be held April 10 with the under tack show set for April 8. 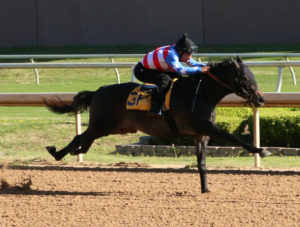 Horses will breeze over the Lone Star Park track, and the sale will be held at the Texas Thoroughbred Sales Pavilion on the backside. The entry deadline for the 2-year-old sale is January 15, and all sale graduates will be eligible for nomination to the 2018 Texas Thoroughbred Sales Futurity to be run at Lone Star with two divisions and an estimated purse of $100,000 apiece. 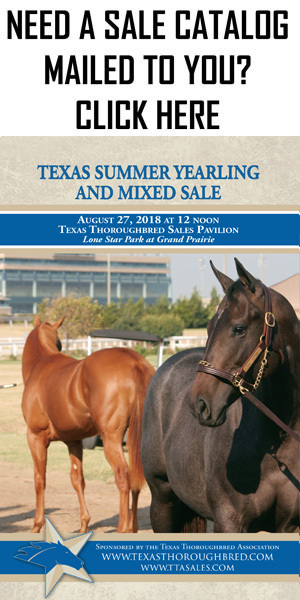 The Texas Summer Yearling Sale has been scheduled for August 27, also at Lone Star. This will mark the third year for the Texas sales under the operation of TTA and Lone Star Park after taking over for Fasig-Tipton. This year’s 2-year-olds in training sale posted an average of $26,770 and gross sales of $1.874 million, compared to an $18,515 average and $981,300 in gross sales a year earlier. Live video of today’s Texas 2-Year-Olds in Training Sale at Lone Star Park will be available when the sale begins at 2pm Central. Please note that the start time has been pushed back from 12 noon to 2pm due to the rescheduling of the under tack show. CLICK HERE TO ACCESS THE LIVE VIDEO. The videos from Monday’s under tack show for the Texas 2-Year-Olds in Training Sale at Lone Star Park have now been posted. To view the videos, click here to go to the sale catalog and then click on the hip number you wish to view. 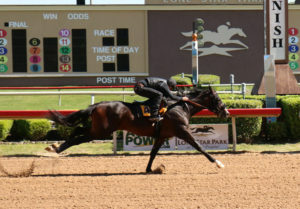 Under sunny skies at Lone Star Park, the rescheduled under tack show for the Texas 2-Year-Olds in Training Sale was held Monday morning with a Louisiana-bred colt by Redding Colliery, hip 31, posting the fastest eighth-mile time of :10.1. The under tack show was originally scheduled for Sunday but had to be pushed back due to heavy rain and thunderstorms in the area. Consigned by Richardson Bloodstock, agent, the fastest 2-year-old in the breeze show is from the second crop of the Mineshaft stallion Redding Colliery, last year’s leading freshman sire in Louisiana. The gray or roan is out of the winning Johannesburg mare Bond’s Babe, whose family includes graded stakes winners Soviet Sojourn and Indian Charlie. A total of eight horses tied for the second-fastest time of :10.2. The sale has been pushed back to 2 p.m. Central tomorrow from the originally scheduled time of 12 noon. The sale will be broadcast live at www.ttasales.com. For a complete list of under tack times, click here. Videos of the under tack show will be posted this evening. For a complete list of times from the breeze show on April 3 at Lone Star Park for the Texas 2-Year-Olds in Training Sale, click here.